A new year gives you a chance to start afresh and plan to create your year of success in business and life. It has an air of positivity about it. A feeling that it doesn’t matter what happened last year, we can turn things around this year. But maybe you’re not feeling like this? Maybe you’re feeling a little apprehensive, or secretly a little overwhelmed at what the new year has in store for you? Well if that’ you, I’ve got your back. This is a letter for you. 1. The best part of Christmas vacation is spending time with friends and family. The worst part of Christmas vacation is spending time with friends and family. You love them dearly and enjoy hanging out with them. Mostly. Or the other one we all love to hear, “What exactly do you do again?” And you spend 10 minutes going around in circles trying to explain it, and getting very strange questions that have your blood pressure rising to near fatal heights, and wondering if it were indeed easier to just go back and get a job so you didn’t have to continue the interrogation. So apart from a few birthday celebrations, the interrogations are not scheduled for another 11 months. So get back to having conversations with your entrepreneurial network as soon as possible, and enjoy having the conversations that “only another entrepreneur” understands. 2. Flow within the structure. If you’re struggling to get your head back in the game, embrace structure. Having a structure to your days, weeks & months, actually gives you more freedom – not less. A lot of people confuse the word “flow”, and use it to describe “I’ll do whatever takes my fancy at the time. Whatever inspires me. Whenever.” This state isn’t flow, it’s stagnation, and leads to a lot of inaction. Think about a river – it flows between the banks, and follows the course. It flows between the structure. And the same with you. Flow doesn’t mean just see what happens, whenever. It means, do what feels right within the framework you create. Once you create a structure or framework, you’ll start to notice a whole heap of new feelings replacing your overwhelm and inaction, like excitement and joy, as you start creating a new level of impact in your business. You will perform better with it! I’ve worked with thousands of business owners and entrepreneurs over the years, and the ones who successfully reach their goals, have all implemented some sort of accountability. Whether it’s a peer group, a mastermind, a mentor, coach, or an accountability buddy – it doesn’t matter. Accountability will help you get honest feedback, will help follow through on commitments, and learn from the failures and success of others, as well as many other benefits. 4. Social Media creates your reality! If you want to have a successful business, you need to be on social media. That’s where your future customers and clients are hanging out. But that doesn’t mean that scrolling through your newsfeed needs to be an exercise that leads to anxiety. So many people say they wish they could get rid of their social media all together. I personally think that’s sad, because I’ve met new friends all over the world via social, and enjoy keeping in contact with them and seeing what they’re up to. However, being consumed by social, and spending hours per day scrolling mindlessly, is not going to lead to happiness, or have you reaching your big, hairy, audacious goals. The first thing you need to know is that your social media feeds are curated by an algorithm which will deliver results to you, dependent on your past actions. If there are people in your newsfeed who trigger you negatively, unfollow or unfriend them. Spend more time commenting and interacting with people who inspire you and fill you with joy. Interact in the Facebook Groups that have great content and conversations, and leave the Facebook Groups which leave you feeling angry or depleted. If you like a positive post in your Instagram feed, don’t just double tap and give a heart; take the time to interact and leave a comment. There are REAL people on the other side of the screen, so treat them like real people. A bit of love and attention goes a long way. Understand that the ads you are served are a reflection of your browsing habits, and are uniquely curated just for you. This is only YOUR reality, not anyone else’s! If you dream of going to the Maldives this year, all you need to do is to Google ‘Maldives vacations’, and visit a couple of different websites, to suddenly have a feed of inspiring vacation ads. Or download an ad blocker. Either way, do what makes you happy! Use social media mindfully, and create your happy reality. 5. Make 2019 the year that you fully embrace your core values. I was once told by my coach, that if I lived my top 3 core values every day, and at least once each week did something in my top 7 core values, I would feel energised and optimistic. Well that coach was right! Know your top core values, and make sure you do something every day that has you living in alignment. Most people will nod their head with this one, but it’s not until you truly embrace living your core values every single day, that you realise how important this is to your inner well-being. 6. Have a plan before you begin your journey. Imagine right now, that you’ve just walked up to the ticketing counter at the airport and asked for a ticket. What does the person behind the counter say? You need to know where you’re going, or you can’t get there. And your business and life is the same. Take some time to create your roadmap, so you can get to the destination. It doesn’t matter HOW you get there, or how long it takes, but you do need to know where you are headed. If you’d like some help with your 2019 plan, I’ve created the Thought Leaders Business Growth Planner. 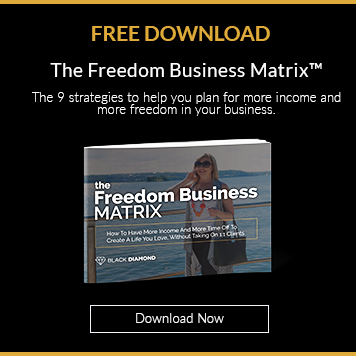 This is the plan that I used to take my start up to over $1M, and have used for the past 25 years, and you can get your free copy here. 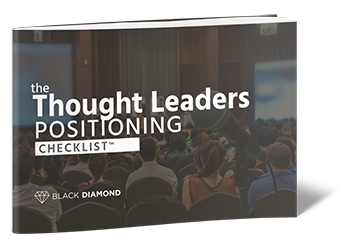 Grab a free copy of The Thought Leaders Positioning Checklist. Join the Business Success Academy Implementation Program. The fast track implementation program to have you you earning $10k reliably and consistently per month in your coaching program, and have you reaching 6 figures, fast. The doors are currently closed, but you can join the waitlist here.